Pack size: 120 tablets per pack. Our eyes are just like our joints, our heart and our muscles - we can take life enhancing supplements to keep them healthy and free of disease. 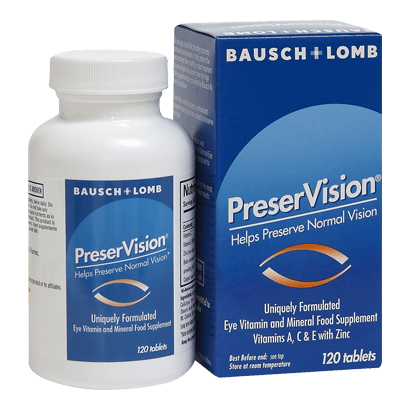 These PreserVision Tablets from Bausch & Lomb have been specifically formulated to provide vital micronutrients that contribute towards lifelong eye health. Able to protect against macular degeneration, they also help maintain day to day eye health as well, and are an ocular essential. • PreserVision Tablets are easy to take and include a full range of nutrients that have been proven by scientists to contribute to eye health, including: beta-carotene, Zinc, Copper and Vitamins C and E.
• Regular intake of the nutrients contained in PreserVision Tablets has been proven in comprehensive studies to protect against age-related macular degeneration, a common and serious disease of the eye. • The tablets come in handy pots with 120 tablets in each. The recommended dosage is four of these pills, two with breakfast and two with an evening meal. • Particularly important for anyone with vision problems who is aged between 40 and 60. As we age, our eyes become less effective, but we can do a great deal to arrest this process of degeneration. Simply taking a few pills every day can make a huge difference. So take PreserVision regularly to ensure that you have the best protection possible against macular degeneration.